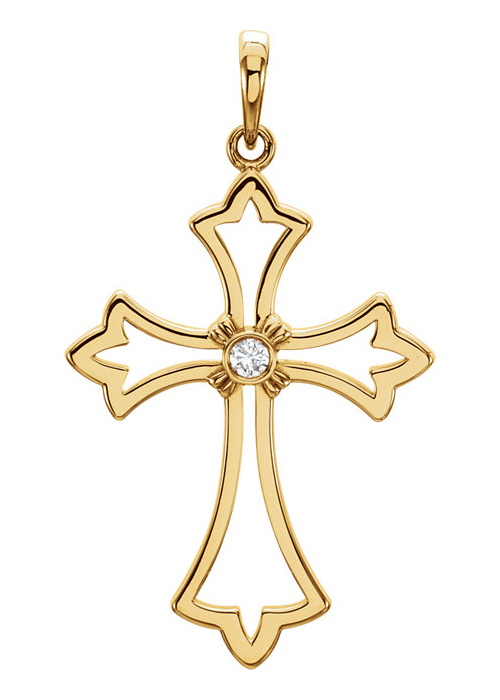 Add a little extra sparkle to each and every day when you wear this women's diamond budded cross pendant in 14K yellow gold from Apples of Gold Jewelry! The warm yellow gold cross, which has a plain, yet highly polished look, has a budding effect on all four of the arms of the cross. The pendant, which measures 1 1/4 inch tall by 3/4 inch wide, has a single 0.03 carat diamond in the center, held in place in with a bezel setting. The diamond, which is G-H for color and I1 for clarity, adds plenty of additional brilliance to this piece of Christian jewelry. "Being confident of this very thing, that he which hath begun a good work in you will perform it until the day of Jesus Christ:"(Philippians 1:6). We guarantee our Diamond Budded Cross Pendant in 14K Gold to be high quality, authentic jewelry, as described above.